Streamline character generation! With demi-human classes you can launch into your game with minimal work. 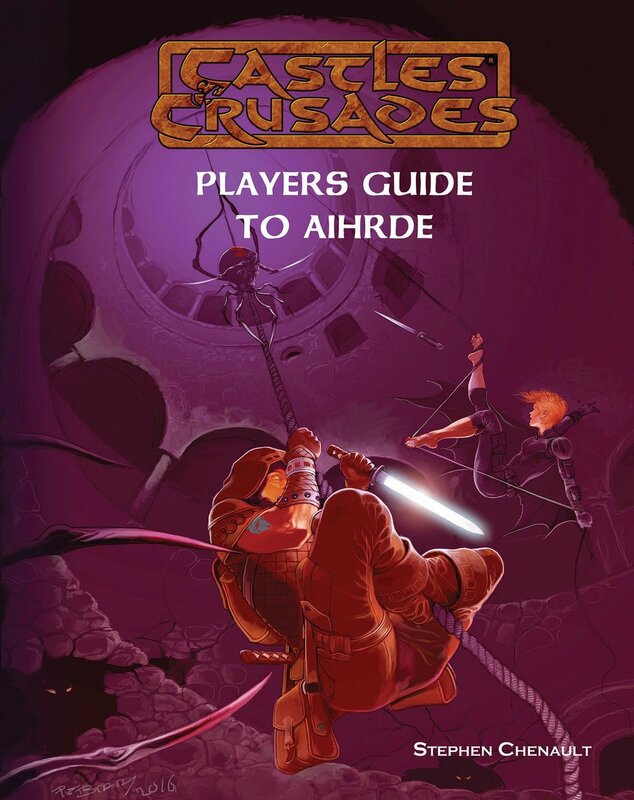 The Players Guide to Aihrde is far more than an introductory book to Aihrde, rather it is a game book designed for players! In the Players Guide you will find demi-human classes, new spells, new equipment including primitive cannon, new spells, the Blood Runes, and learn the benefits of communing with the gods! In the Players Guide we introduce the demi-human classes: dwarf, elf, halfling, gnome and goblin. Iron Born: The dwarves of Aihrde are powerful creatures, favored by the All Father. Stout of heart, keen and detemnined. They are driven by the Andanuth the oath of life to their forefathers made to the all Father in long ago Days before Days. High Elves: Steeped in the magic of their own creation he High Elves straddle the line between the mundane and the magical. They serve their own purposes, seeking eldritch treasure and might that others shun for fear of dread. The Reborn: Goblins of the Red God’s making, but ones who have shunned his path. They are reborn. Their powers are steeped in their own history and that of the world, they do not dabble in sorcery, but rather, are a font of it. Hugrin Dun: The gnomes are a stout people and worship the fallen goddess. With the strength of her in mind they have always stood the battering of the world. They are creatures who have mastered the primeval world and unleashed it. Wolf Hounds: Halflings, called the Felon Noch by the Dwarves, who have been forced to shed their civilized skin and live a life on the edge of the wild, hunted for many long years. Now they seek to mete out vengeance and death, for the dead rarely hound the living. Demi-humans are rounded up with rules particular to each of the five peoples, dwarves, elves, halflings, goblins and gnomes. The Players Guide offers far more than just demi-human classes however, for within it you’ll find more spells, equipment, fast paced combat rules, as well as the learn the secrets of the Blood Runes, those ancients magics that allow one to pass through time as a shadow. With the Blood Runes comes a discussion of time travel in game context. Beyond that are the gods, each major deity of the world is outlined for the players use. For instance, those who worship Firthnach, the Travelers can gain luck on the road (this translates to re-rolling a dice). And once you are through the gods, you’ll see the guilds of Aihrde. The Players Guide is a small resource with a massive amount of gaming material! Aihrde is a giant setting and a world rich in detail. The Players Guide helps to bring the world alive at the table. But it stands by itself. Even those who do not play in the world of Aihrde can use this book and its basic classes and magic to bring a whole new feel to the table. Aihrde is an unparalleled fantasy setting. The world of Aihrde spins upon an earth-like axis of ancient civilizations where good and evil have struggled for countless years. It is a world that bears the markings of its past; where ancient evils slumber, stained with the power of eldritch wizardry; where gods dwell in bejeweled halls of wonderment, worshiped by men and women of all creeds; where dragons live in great dens of heaped treasure; where the new stands upon the ruins of the old in beds of ancient glory.